Can you tell us what we can expect in your class? A warm welcome, a relaxed atmosphere for a gentle hatha yoga practice. The focus is to synchronise your breath with movement , mindfulness and listening to your body, tuning into to your self. 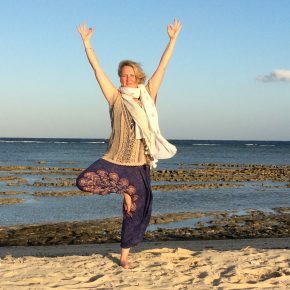 When did you first realise that you wanted to be a yoga teacher? What was the wow moment if any? Savasana (corpse pose)in the relaxation at the end of a beautiful hatha yoga class at Yoga life studio and experiencing a beautiful sense of calm and joy, and thinking I am at home….I would like more of this! Where is your favourite place to practice? Outside (ideally on a sunny day) immersing myself in nature , grass /sand/earth under my feet, sun warming my skin, gentle breeze blowing on my face. Have you got any advice for new students? Let go of any concerns or worries. Yoga is for ALL and everyone’s experience is unique. I particularly enjoy the aspect that it is not competitive it is truly about your own practice which is facilitated by the yoga teacher. I think I may be a bit yoga obsessive, so with out going over the top, I will simply say it makes my heart sing! What is your favourite posture/practice and why? Wheel , because it makes me feel like super woman, strong and empowered. Can you share 3 interesting facts about yourself? 1)I adore animals, have a pet dog, cat, corn snake and a flock of hens…and of course they all have names! 2) Some years ago I was commissioned to create an artwork to be displayed next to a Francis Bacon painting. What is your personal motto or favourite quote? It is not wrong to desire it. I am planning to set up yoga-art workshops, so watch this space! 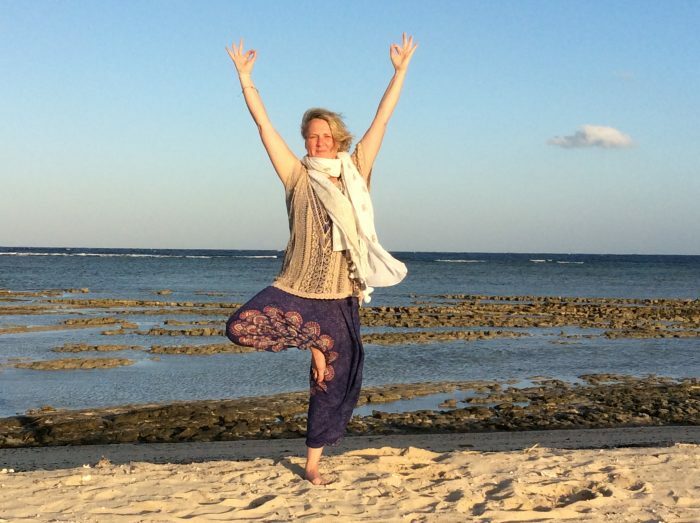 Vicky teaches Lunch Yoga class at our studio on Tuesdays at 1pm, all welcome!